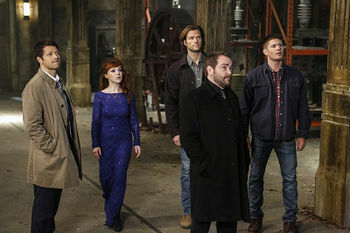 Outline With the aid of Lucifer, Crowley, and Rowena, the Winchesters and Chuck pool together the resources of Heaven and Hell to take the fight to Amara. At the Men of Letters Bunker, Lucifer is acting like a sullen child, angry with his Father, wanting an apology for being given the Mark of Cain and then cast out. Sam and Dean try to intercede and get them to reach some kind of reconciliation so they can move forwards against Amara. They orchestrate a Dr. Phil-type intervention to get them to speak. After some bickering, God tells Lucifer that he was His favorite and that He gave him the Mark because He thought he was strong enough to handle it. When He realized He was wrong, He hated Himself and so He punished Lucifer. Then he sincerely apologizes. Chuck and Lucifer agree to work together to capture Amara and put her back in her cage -- she can't be killed because that would cause an imbalance between Darkness and Light. Without the other archangels, though, they still don't have the power that was needed originally to box Amara. Unfortunately, they don't have the time for Chuck to rebuild the archangels as it's a much larger task than restoring rank and file angels like Castiel. Chuck asks for alternatives. Dean suggests Crowley, Lucifer suggest angels, and Sam suggests Rowena. They each go to meet with their suggested allies to convince them to join the fight. All are resistant at first, thinking the plan is weak, but eventually agree to join, perhaps with some intervention from Chuck. Once all the support is in place Sam, Chuck, and Lucifer agree that the plan is to use the angels, demons, and witches to weaken Amara and then Chuck will finish her off by removing the Mark and putting her in the cage. Dean is adamant that they should kill Amara and head off any chance of her getting back out. Lucifer steps in and says that Dean wants God to kill her to make up for his failure to do so earlier. Dean counters that he tried to kill her once but it didn't work; Chuck suggests "maybe it didn't work because you didn't want it to." Meanwhile Amara is beating Donatello to get information on Chuck. He won't give in, so she consumes his soul and finds out that Chuck is in Kansas. Amara arrives at the Bunker, burning the warding sigils away so that she can enter. In an old power plant Sam, Dean, Chuck, Lucifer, Crowley and Rowena are discussing the plan. They talk about which group should go first, each trying to push off to the others. Then it is revealed that Chuck will take the Mark away from Amara and give it to Sam. Naturally Dean balks, but Sam puts him off as Dean has already admitted that he can't hurt Amara. When Dean asks what they'll do when the Mark takes over, Sam tells him to lock him up and throw away the key. While Amara is still in the bunker, going through things in Dean's room, Rowena gets inside her head and tells her that she is with God and she will show her where He is. Amara comes, telling Rowena that she knows it is a trap but she just wants a one-on-one with her brother. Amara comes to the power plant and Rowena uses the power of five witches to attack her. Amara stumbles, but is not taken down. Rowena is thrown to the ground and the other witches have their faces burned out. Next the demons arrive, surrounding her in a force of black smoke. Crowley "smokes out" of his meatsuit and adds a crippling blow. Amara is hurt, but gets back up. As she approaches Chuck, Lucifer stabs her in the back with a spear. She is on the ground as Chuck apologizes to her. Amara asks what she did to deserve being put way for so long. Chuck says that His world needed to be born and she wouldn't let it. Amara counters that she was banished because Chuck couldn't stand being equals with her, that He wants to stand above everything else. Chuck agrees but says that there is value in creation. That it didn't come from his hands, that it was just there, needing to be born. Amara concedes that Chuck has won and asks him to kill her. When the Mark starts to burn off of her and onto Sam and she realizes that she is not to be killed, but put back in a cage, Amara fights back. She burns Lucifer out of Castiel's body, leaving Cas slumped, unconscious, against a post. She seizes Chuck and suspends Him in air. She hits Him with black tendrils of smoke that create large holes in His body. He is enveloped in white light and falls to the ground, unmoving. Amara tells them that He is not dead and that He won't be until He sees his whole creation burning in ruin. Sam: W-we all know that you are God, um, but, maybe could you be a-a little less... Lordly? Chuck: But I am -- I-I'm the Lord. Chuck: I did what had to do. To create the world, I had to lock Amara away. And when the Mark corrupted you and I saw that you posed a threat to humankind, I did the same with you. Lucifer: No, you betrayed me. You gave me the Mark to lock her away, and when it changed me, when it did what the Mark inevitably does... you threw me away. Chuck: No, son. The Mark... you always cast a jaundiced glance at humans. The Mark didn't change you. It just made you more of what you already were. Lucifer: What I was was your son... your child. Castiel: You know, every second I've spent subordinating myself to Lucifer, it's been a torment. It's destroying me, it's burning through my vessel. But I would do it all over again, because through me, he and God, they will defeat the Darkness. That's my role in this fight. It's God's fight. You can play a part in that fight too... if you join me. Dean: I tried to kill her. And it didn't work. Chuck: Oh yeah. I've been quietly rooting against you both for some time now. Although, I can't deny you're one of my guilty pleasures. Dean: Alright, no flirting. And no fighting. Sam: We talked about this. It's time to do the smart thing. Dean: Oh, you mean babysitting the bad guys? Okay, Sam. Okay. God's plan. Amara: An apology at last. What's sorry to me? I spent millions of years crammed in that cage... alone... and afraid, wishing -- begging for death, because of you! And what was my crime, brother?! Amara: That's your story. Not mine. The real reason you banished me, why I couldn't be allowed to exist... you couldn't stand it. No, we were equals. We weren't great or powerful, because we stood only in relation to each other. You think you made the archangels to bring light? No. You made them to create lesser beings, to make you large, to make you Lord. It was ego! You wanted to be big! Chuck: That's true. But it isn't the whole truth. There's a value, a glory in creation... that's greater and truer than my pride or my ego. Call it grace, call it being! Whatever it is, it didn't come from my hands. It was there... waiting to be born. It just is, as you and I just were. Since you've been freed, I know that you've seen it. Felt it. Amara: It didn't have to be like this. I loved you, brother. Well... you've won again. Finish it. Kill me. Amara: I'd die a million times and murder you a million more before going back there! Tell me... if you won't change, why should I? Dean: Amara, what have you done? Amara: No. He's dying. My brother will dim... and fade away into nothing. But not until He sees what comes next. Not until He watches this world, everything He created, everything He loves turn to ash. Welcome to the end. Shall be my brother; be he ne'er so vile,"
Lucifer: Enemy of my enemy is my friend. Team Amara. Go, Amara. "The enemy of my enemy is my friend" is an ancient proverb that dates back to the 4th century BC. Sam: Lucifer!, You know, at some point in time, you're gonna have to come out and-- and talk to... God. Dean: This is like the worst episode of "Full House" ever. Full House is an American sitcom from the late '80s and early '90s that revolved around a widowed father raising his three daughters with the help of his brother-in-law and his best friend. The show featured many heartfelt talks about minor family conflicts. Crowley: We can do this. Lucifer stole the throne. His authority weakens the longer he's MIA. The time is ripe for a coup. That's why I brought you here. Together, we can reclaim the throne. Together, we can make Hell great again. "Make America Great Again" is a campaign slogan used by American politicians, most recently Donald Trump. Dean: Okay. Let's -- let's try 'I feel' statements... Dr. Phil. 'I feel' statements, or I-messages, are a communication tool used with the intent to be assertive without putting the listener on the defensive. Dr. Phil is an American TV personality who presents himself as something of a relationships advice guru. Dean: Pretty sure that's all fathers. Tautology is a form of rhetoric, where the same thing is said twice in different ways. Chuck: Okay, enough from the peanut gallery. The peanut gallery was a vaudeville term for the cheapest seats at a show, from which the audience would typically heckle the performers. Lucifer: Welp... I came here to ask a good-faith favor of you folks, but as you are... clearly less than kindly disposed, perhaps you'll, uh, lend an ear to my very own Jiminy Cricket? Hmm? Pinocchio is a wooden puppet, and his maker Geppetto wishes that he could be a real boy. A blue fairy grants the wish, on the grounds that Pinocchio prove that he can act like a human boy. Since Pinocchio has no conscience, a cricket called Jiminy agrees to act as his conscience. Crowley: Game of Thrones. It's musical chairs. Still... I wanted it -- to go out with the crown on my head! Game of Thrones is a TV series based on the the epic fantasy book series titled A Song of Ice and Fire by author George R.R. Martin. A major theme is characters battling to win power - a game of thrones. Musical chairs, also known as Going to Jerusalem, is a game where players march to music around a row of chairs numbering one less than the number of players, and scramble for seats when the music stops. Chuck: Amara's looking for me. But I'm warded against her, for now. The second I drop the warding, she'll show. She'll be expecting a fight, and we'll give it to her. Shock and awe. Shock and awe. Shock and awe is a military tactic employs a massive display of force to both practically and psychologically overwhelm the enemy. When the camera speeds through into Donatello Redfield's home, it is very reminiscent of the "rammo-cam" shots that director Sam Raimi would frequently use in the Evil Dead series. Clea: Second? Why don’t you ask Charisse, or Melodie, or Thomasin? Oh yeah, you torched them all in one of your impetuous little fits. Clea is referencing the time when Rowena incinerated a trio of witches from the inside out in 11.03 The Bad Seed after they refused her invitation to join her 'Mega Coven'. As Lucifer is being ripped from his vessel, Misha Collins' face briefly morphs into Mark Pellegrino's. When we see Amara beating up Donatello, the house number is 216, which is 6 cubed... an oblique reference to the number of the beast, perhaps. This page was last edited on 16 November 2018, at 05:27.